This one kind of encapsulates Season XI for me in that it does still have a lot of the post-Rob-Grant flaws – some failing jokes, a lack of direction (have they given up on trying to get back to Earth? Can they say so?) – but the good bits are really making up for it now. I don’t think that in this season, any of the main cast have had those character-breaking moments that BTE and X were riddled with, which was the worst thing for me. 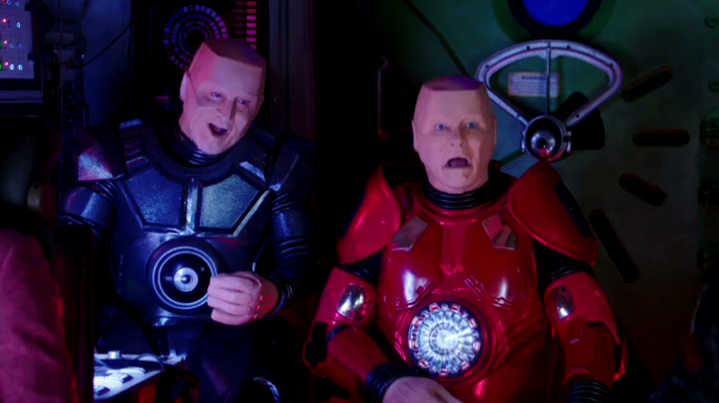 And Butler was the best guest character since… oh, Ace Rimmer? The “consulting the universe” stuff I thought was a bit derivative of Hitchhiker’s Guide, but there are worse things to be derivative of. And sorry to be right on, but I make this the third episode in a row with no women in supporting roles (I count six guest characters in those episodes, including the voice of the Universe.) They got away with that in the 1990s but it sticks out now. And jesus, that gelf costume was a bit unfortunate. I think they can still get away with no women in supporting roles considering it’s a story about 2 men a mechanoid and a humanoid cat male drifting around in space. Don’t get me wrong I like when they bring in an interesting cast of characters but it’s kinda hard to include more women in a show like this without just resorting to tokenism. I’d rather it was all male than having crappy female characters. Although I guess you could argue that it’s time to bring kochanski back. One show that I’ve been watching lately (and highly recommend) that does the whole lost in deep space with a rag tag crew is Dark Matter. I really like what they’ve done with the female characters in that show because they seem real. Even in the supporting roles, these female characters have diverse personalities. The big difference is that Red Dwarf is a comedy, so it becomes difficult to write any character that isn’t just there to aid some kind of joke. Another good example is The Martian. Not quite the same premise but I think that movie did a good job of including a diverse cast of characters without making a big deal of it. And the characters were really interesting. Anyways, I’m done rambling. It would be interesting to see more scenes like we saw in Samsara, but I’d rather they focused on creating good characters instead of forcing diversity. Previous Previous post: Announcing: The 4th Annual Noiseless Chatter Xmas Bash!!! !